Steel has the most shear strength and holding power. Steel performs well in the freshwater environment. Steel sheet-piles can be driven into any type of soil. Steel seawalls are more damage resistant and last longer. 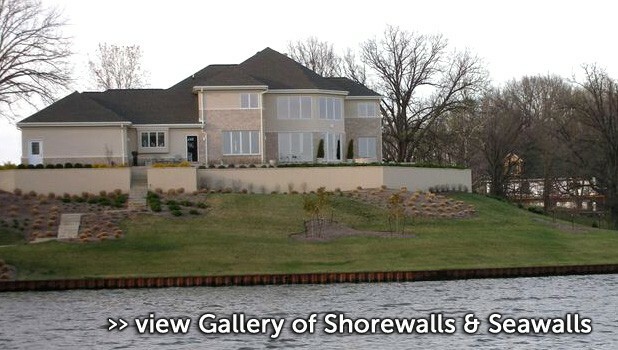 Maintain the attractiveness of your shoreline with steel shorewalls, the durable, esthetically-pleasing way to protect and enhance your lakefront.One installation on Lake Springfield lasted over 50 years. The 8-guage sheet piles are driven over four feet into the ground, eliminating all undermining from wave action. Interlocking grooves along the vertical edge of each sheet lock adjacent piles together, forming a continuous steel barrier against erosion. The equipment to install the piles is barge-mounted, so no heavy equipment is driven over your lawn and landscaping. Heavy angle-iron is welded to the top of the wall, to give it a rigid, finished edge. Steel rods are welded to the land side of the wall, and then to steel beam posts spaced every six feet, to hold the wall in position. Soil is then dredged from the lake bottom and placed behind the wall, to dry and then be planted with grass or landscaping. What are the Advantages of Steel Shorewalls over Rip Rap? Riprapping with large rocks is inexpensive, but has many drawbacks. Ice dislodges the rocks, requiring re-stacking on a regular basis. Weeds grow between the stones, attracting snakes, muskrats, and other vermin. Weed killers may contaminate the lake water. Riprap is unstable and difficult to walk on. Your access to your waterfront is greatly reduced. Waves pounding against a rocky shoreline can quickly damage a boat. Why Choose Steel Shorewalls Instead of Concrete? Vertical concrete walls are also prone to ice damage. Since concrete cannot flex, it cracks. Concrete walls are also subject to wave action, washing soil out from under them, causing them to shift and eventually fail. Removal of the unsightly failed concrete is expensive. What are the Problems with Vinyle or Plastic Shorewalls? What are the Advantages of Steel Shorewalls over Wooden Shorewalls or Barriers? Wooden shorewalls cannot withstand the pressure of wave action and soon look decrepit. They are not heavy enough to be backfilled with heavy dredgings from the lake bottom. Dry fill must be hauled in and will eventually wash out from under the wooden wall, which cannot be driven in deep enough to hold the fill. Chemicals in pressure-treated wood can be leached out and contaminate the lake water. 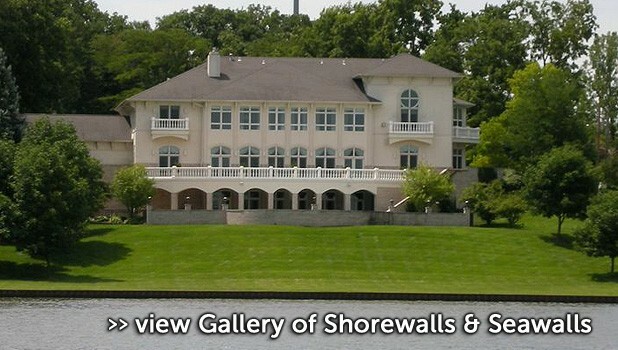 What are the Problems with Vinyl or Plastic Shorewalls? Vinyl sheet piling is sometimes used. Like all plastic, it eventually breaks down from the ultraviolet radiation in sunshine. Plastic also becomes brittle an cracks in cold weather.